How can digital breadcrumbs help us understand the FSB claims? On August 10, Russia’s FSB made an explosive claim: they foiled a Ukrainian-led terrorist attack in Crimea, resulting in the deaths of an FSB officer and a Russian soldier. 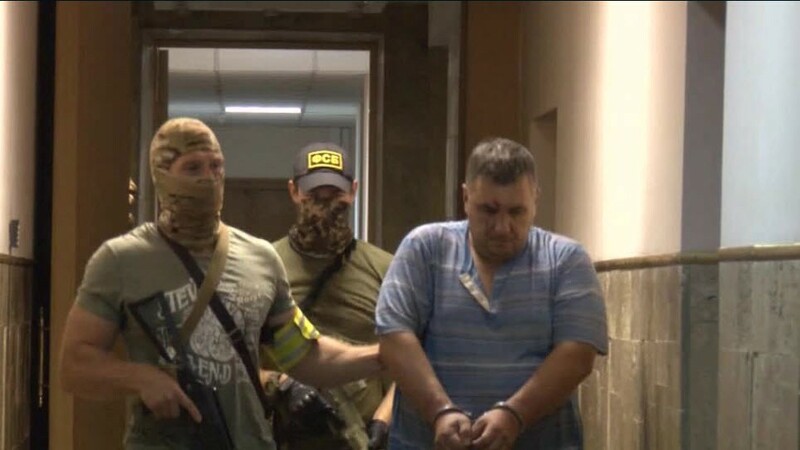 This attempted attack, as the FSB claims, took place from the night of August 6 until August 8, when a group of “saboteurs” from Ukraine were discovered in the Armyansk area of northern Crimea. A fight resulting after an attempt to arrest these “saboteurs” led to the death of an FSB officer and the discovery of a large cache of weapons: improvised explosive devices, TNT, mines, grenades, and so on. A Ukrainian man, Yevgeny Panov, born 1977 from the Zaporozhye Oblast, was detained along with others. Furthermore, according to the FSB claim, the Ukrainian Armed Forces conducted shelling from the Kherson Oblast, killing one Russian soldier. Russian state newspaper Rossiyskaya Gazeta (RG) fills in additional details. Per RG, “about 20 people” were seen in Armyansk on August 6 with weapons and explosives, wearing Russian military uniforms. As expected, Ukraine has dismissed these reports, along with most Ukrainian and many Western journalists. It is too early to completely dismiss or confirm the FSB account, or any particular elements from it; however, there are a handful of open source materials from the past week that help shed light to help us understand. The FSB narrative of a border attack shares some similarities with an account that spread through various pro-separatist news sites. The “independent expert” Tanay Cholkhanov, who has regularly given dispatches and interviews related to the war to separatist and pro-Russian websites over the past two years, made a startling claim on August 8: Ukraine has killed three Russian soldiers. Locals passing by started to report shots in the Armyansk region, gunfire. There were reports of an attempt to break through from the Ukrainian side. Later on, there were no reports in the mass media, but at around noon witnesses started to claim that there were ongoing armed clashes and helicopters circling the sky in northern Crimea. (…) By evening, the number of police cordons increased. At the moment, soldiers continue to be on alert. The media still does not report on what is happening. It is known that three Russian servicemen have been killed, and three are wounded. Artillery systems and military equipment are being moved towards the isthmus [of Perekrop]. In fact, there was an attack on the territory of the Russian Federation. However, there are few reliable witness accounts of these incidents from local residents on Vkontakte, Odnoklassniki, Twitter, or elsewhere. There were news reports on an incident that took place around 4–5am on August 7, including a firefight leading to one death and three wounded at the border, but not to the degree described by Cholkhanov. As for the shelling, there is scant evidence for this taking place at all. Additionally, there is not a single photograph or video of these incidents of gunfire and shelling. It is possible that these attacks happened just as described by the FSB, but it is also possible that only the Armyansk firefight happened (with one, not three deaths) in the early hours of August 7 and the FSB incorporated in elements of unconfirmed online accounts. This would not be the first time for such a thing to happen. In its July 21, 2014 press conference regarding the downing of MH17, the Russian Ministry of Defense used elements of a disproved story from Russian social networks that erroneously claimed that a billboard seen in a video was in a city other than Luhansk. Russian deserters, disguised saboteurs, or no one at all? 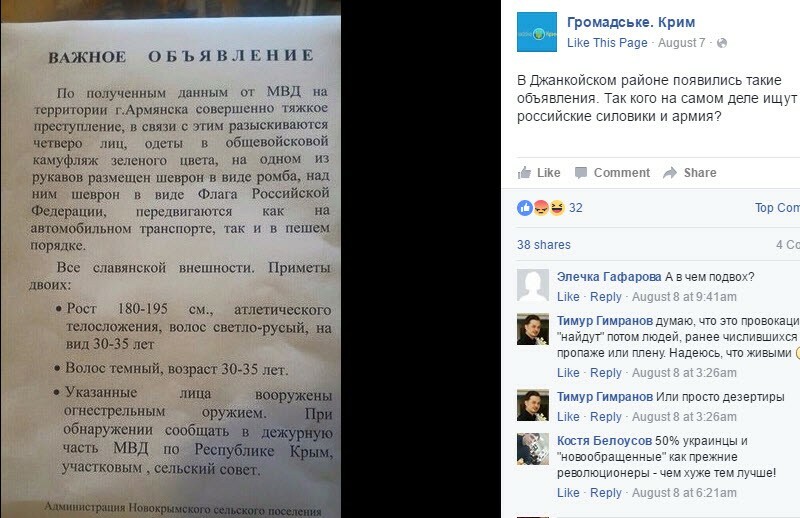 On August 7, “Hromadske Crimea” shared an image on its Facebook page that claimed to be an announcement distributed in Crimea by the Administration of the Novokrymsky Rural Settlement. According to information received by the Ministry of Internal Affairs in the city of Armyansk, a crime has taken place. In connection with this, four persons are being sought, who are dressed in military camouflage green, with a diamond chevron with the flag of the Russian Federation on one of the arm sleeves. They are moving both in a motor vehicle and on foot. — Height of 180–195cm, athletic, blonde hair, looks to be 30–35 years old. — Dark hair, looks to be 30–35 years old. A similar note was shared by Eduard Zhuravlev from Crimea. 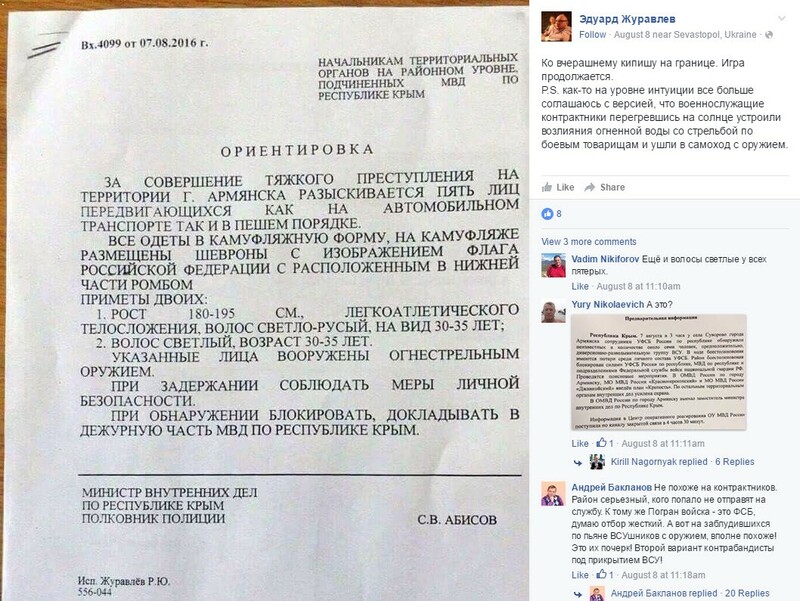 The content is virtually identical, and supposedly comes from Sergey Abisov from the Crimean Ministry of Internal Affairs. Much like the previous separatist dispatch, these documents have not been verified. However, the parallels of timing and content between the FSB account of “Ukrainian saboteurs” and these four men wearing Russian military uniforms is uncanny. On August 9, Ukrainian official Anton Gerashchenko said that there were Russian soldiers who deserted and may attempt to enter Ukrainian territory. Gerashchenko went on to state that “these guys did not enter Ukraine” and that two border crossings between Crimea and the Kherson Oblast were closed. As with many other factors of the events in Crimea over the past week, it is unclear if these four men were Russian soldiers deserting, Ukrainians agents wearing Russian uniforms, or do not exist at all. Photograph of Panov in 2010, from his personal Vkontakte page. There are six additional “saboteurs” who were captured by the FSB, per Russian media. 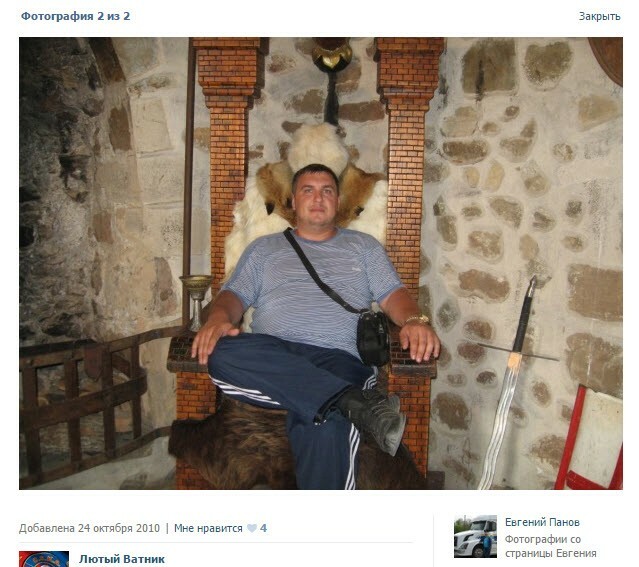 Because of the arrest of Panov, it has become clear that the Armyansk incident was not invented by the FSB, as many have claimed online, though details provided are difficult to verify. Outside of the competing narratives of terrorist attacks, saboteurs, and deserting soldiers is a more mysterious event: the sudden build-up of Russian military equipment in Crimea, including transport of the Bastion-P coastal missile defense system (NATO designation “SS-C-5 Stooge”). On August 7, a series of videos and photographs were shared online of Russian military equipment moving towards or through Crimea. The materials were supposedly taken the previous day, August 6. Some media reports indicate that some movements may be part of a planned rotation. Over the following two days, a deluge of photographs and videos appeared online documenting the movement of other military vehicles, including the Bastion-P mobile coastal defense missile system, moving through Crimea towards Simferopol. Today, state newspaper Rossiyskaya Gazeta stated that the Ukrainian “saboteurs” planned on destroying the road between Simferopol and Yalta — the same highway of many of the sightings of Russian military equipment. This plan only came about after local residents alerted the FSB to the supposed Ukrainian saboteurs on the night of August 6, yet it is difficult to imagine that the mass mobilization of equipment across the Kerch ferry and through Crimea came about after and entirely due to this incident. Follow the latest Minsk II Violations via the @DFRLab’s #MinskMonitor. For more indepth analysis from our regional experts follow the AtlanticCouncil’s Dinu Patriciu Eurasia Center. Or subscribe to UkraineAlert. Information has been added to this post since its original publication, including further information on Yevgeny Panov from Russian state media, reports regarding military movements, and witness/news reports of gunfire in Armyansk on August 7. @AtlanticCouncil’s Digital Forensic Research Lab. Catalyzing a global network of digital forensic researchers, following conflicts in real time.